The city known today as Klaipeda is on the Baltic coast of Lithuania. In 1944, it was the East Prussian city of Memel, at the northern extremity of East Prussian territory. At the end of the Great War, 80 per cent of the city’s population was German, but most of those living in the countryside around Memel were Lithuanians – a situation analogous to that in and around Danzig. The Lithuanian delegation at the Versailles peace treaty conference requested that ‘Memelland’ be placed within the bounds of the new state of Lithuania, but instead the conference powers removed the area from Germany and placed it under French jurisdiction, under a League of Nations mandate. In 1923, the Lithuanian population in the enclave rose up in revolt. Lithuania’s tiny army went to the aid of their fellow countrymen, and the small French garrison was withdrawn. Despite official protests, there was nothing that the League of Nations could do but accept the Lithuanian annexation of Memelland. The German population of Memel was never reconciled with the city’s new status, and unrest continued through the 1920s and 1930s. The Nazi Party established a new local branch in 1933 and met with rapid political success, resulting in the party being banned by the Lithuanian government the following year. The party’s leadership was arrested and sentenced to imprisonment with hard labour, which attracted vociferous protests from Germany, especially from East Prussia, where Koch was particularly active in promoting the rights of Germans in Memel. In a series of press announcements, he spoke about the threat to the German population of Memel, and demanded that the signatories of the Treaty of Versailles enforce what had been agreed. This demand was, of course, impossible to satisfy, and formed part of an overall German policy to portray the Memelland Germans as an oppressed group who were not being helped by those who had placed them in their current state. Thus the German government paved the way for Germany to take matters into its own hands. Plans were laid for a German seaborne invasion of Memelland in 1938, to be implemented in the event of a Lithuanian-Polish conflict. In 1939, Hitler demanded that the region be returned to German control, and in the face of the barely veiled threat of German military intervention, the Lithuanian government had no option but to agree. Nevertheless, they delayed giving their consent as long as they could, with farcical results. Hitler planned a triumphant entry into the city aboard the pocket battleship Deutschland. A last-minute overnight delay left him sending irritated signals to his Foreign Minister Joachim von Ribbentrop in Berlin to determine what was happening. Finally, early on the afternoon of 23 March, a seasick Hitler was able to come ashore in the city and proclaim its return to the Reich. The following year, Lithuania, Latvia and Estonia were forcibly occupied by the Soviet Union, a consequence of the Molotov-Ribbentrop Pact that also carved up Poland. Many citizens of these countries fiercely resented the presence of the Soviets, and consequently welcomed the Germans when they invaded in 1941. Latvians and Estonians joined the SS in substantial numbers, although the Lithuanians appear to have been somewhat cooler towards the Germans, many regarding the German occupation as the lesser of evils. As General Ivan Bagramian’s armies approached the Baltic in 1944, tensions began to rise. Ivan Khristoforovich Bagramian was born the son of a railway worker in a village in what is now Azerbaijan. After serving in the Russian Army on the Turkish front during the Great War, he joined the Red Army and took part in fighting during the civil war against nationalist forces in the Caucasus. In 1941, Hitler’s invasion of the Soviet Union found him appointed as Deputy Chief of Staff” of the Southwest Front, based at Kiev. He was one of the few senior officers to escape the German encirclement of the city. After a brief spell as Chief of Staff to Timoshenko in 1942, he was appointed to command first 16th Army, then 11th Guards Army, before taking command of 1st Baltic Front in 1943. He executed his part of the Stavka (Soviet general headquarters) plan for the summer offensive in 1944, enveloping Vitebsk and then pressing on westwards to Polotsk, even though the losses suffered by his armies ‘shook him to the core’. During the exploitation that followed, though, he grew increasingly unhappy about the mass of the German Army Group North, hanging over his armies as they pushed on westwards. He asked in vain several times for permission to strike north towards Riga, in order to isolate the German divisions that were being bloodily prised out of their defensive lines east of the city. Finally, when his forces had penetrated into the heart of Lithuania, taking the town of Siauliai – Schaulen to the Germans – on 27 July, he was given permission to turn north in force. The road from Siauliai to the Baltic coast immediately west of Riga covers a distance of about 120km; Bagramian’s armour travelled along this route in three days, isolating Army Group North in and to the east of Riga. This triumph was achieved at great cost, and even greater risk. Bagramian’s armies were badly over-extended, and barely able to hold their positions let alone take advantage of their gains. For a few brief days, almost all of western Latvia was undefended by the Germans, but Bagramian simply didn’t have the reserves to exploit this situation. He had his hands foil beating off attacks against his forces from the east, where Army Group North attempted to break out, and more significantly from the west, where several German divisions – Panzer Division Grossdeutschland and 4th, 5th and 7th Panzer Divisions – attempted to force their way through. Although this powerful armoured force was blocked, it was at the cost of weakness elsewhere on 1st Baltic Front’s extended frontline, and an ad hoc German battlegroup was able to re-establish contact with Army Group North along the Baltic coast. Briefly, the front stabilized, but Stavka now prepared plans for what was intended to be a final blow against Army Group North. Starting in mid September, the three Baltic Fronts, followed a few days later by the Leningrad Front, would attack Schörner’s armies on all sides. At first, Afanasii Beloborodov’s 43rd Army, part of Bagramian’s command, made good progress, but the attacks of the two other Baltic Fronts made little headway. The Germans were aware of the Soviet build-up, and fell back methodically from one defensive line to the next, inflicting a heavy toll on the attacking formations. It was only when the Leningrad Front joined the attack that significant headway was made. Meanwhile, the German armoured formations that had unsuccessfully attempted to break through from the southwest now attacked again. Although they once more made little headway in difficult terrain, they forced Bagramian to divert forces that he had intended to throw at Riga. It was clear that the concerted assault to eliminate Army Group North was not going to succeed. On 24 September, therefore, Stavka issued revised instructions. Bagramian’s 1st Baltic Front was to switch its line of advance from a northwards drive towards Riga, to a westwards drive towards Memel. There were several advantages in such a move. First, it would move the attack to an area where there had been no significant fighting since the original German advance in 1941; the roads and bridges over which Bagramian would advance were therefore in good shape. Second, it would allow Soviet forces to reach Reich territory, something of huge political significance. The logistical challenge of this shift of emphasis was formidable, but it was a sign of the growing skill of the Red Army that it was carried out efficiently in less than two weeks. Half a million men, 10,000 guns and mortars and more than a thousand tanks, together with thousands of tons of fuel, food and ammunition, moved west into new positions, a displacement of about 200km over poor roads, many of them already severely degraded by the earlier passage of German and Soviet armoured vehicles. Furthermore, it was carried out mainly at night, to reduce the risk of the Germans detecting the movement. By day, the troops took cover in the plentiful woods of Lithuania. By early October, though, it was impossible to hide the growing preparations. The 3rd Panzer Army, commanded by Generaloberst Erhard Raus, had two corps covering the frontline in front of Memel. These corps between them had only five divisions, stretched over 200km. 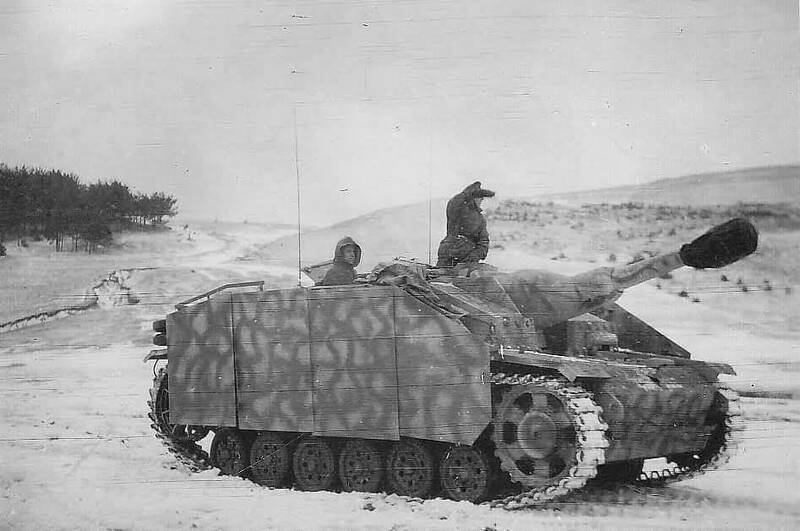 In the north was General Hans Gollnick’s XXVIII Corps, and on the eve of the Soviet attack it received welcome reinforcements in the shape of the Panzer Division Grossdeutschland. A shortage of fuel and railway rolling stock, however, meant that the division would arrive piecemeal. Grossdeutschland was one of the premier formations of the Wehrmacht. Its tank regiment had, in addition to the usual two battalions of Pz. IVs and Panthers, an additional battalion of heavyweight Tiger tanks, with their lethally effective 88mm guns, and a separate battalion of assault guns. Its two armoured infantry regiments, Panzergrenadier Regiment Grossdeutschland and Panzer-Fusilier Regiment Grossdeutschland, were at this stage of the war as weakened as other similar formations, but the news on 3 October that the divisions Tiger battalion, an additional attached tank battalion and the division’s powerful reconnaissance battalion, were to move south to support XXVIII Corps was very welcome. Part of this force was immediately assigned to support 551st Volksgrenadier Division, in preparation for plans to eliminate enemy bridgeheads over the River Venta near Kursenai, secured by the Red Army the previous night. Long experience had taught the Germans the need to eliminate these small bridgeheads as quickly as possible, otherwise the Soviet forces would swiftly increase the strength of the units within them to a point where they could serve as springboards for an attack. The officers of Grossdeutschland were swiftly brought up to date by Gollnick’s staff at XXVIII Corps. Information from a variety of sources – aerial reconnaissance, radio intercepts and interrogation of deserters and prisoners – suggested that an attack was imminent. It was unlikely that Grossdeutschland would have sufficient time to form up all of its forces. The initial weight of the attack would fall on 551st Volksgrenadier Division. The total force deployed by the Red Army amounted to 19 rifle divisions, three tank corps and an artillery corps. But the rifle divisions were substantially below their establishment strength, and what manpower they had was often poorly trained. The 43rd and 51st Armies, for example, were composed of a single rifle corps each, consisting of three rifle divisions. On paper, these divisions were intended to number about 11,800 men each, but in practice they rarely had more than 7,000, often as little as 3,000. Nevertheless, the preponderance of power lay greatly in favour of the Red Army. The Baltic coast was roughly a 100km west of the frontline. To the north, 2nd and 3rd Baltic Fronts continued to exert pressure, squeezing Schörner’s Army Group North back through Riga into Estonia. By the standards of the great summer offensives, the Red Army’s resources, particularly in terms of reserves available to exploit a breakthrough, were limited, but several opportunities presented themselves. A single-minded drive west would sever Schörner’s armies from the rest of the Reich, leaving them dependent on seaborne supplies. Given the weakness of the German defences, there was also the enticing prospect that a breakthrough to the coast would open up the rear of Army Group North, allowing Bagramian’s armoured forces the opportunity of perhaps rolling up the entire German front, or at least of seizing the vital port of Libau, without which the Germans would struggle to keep Schörner’s two armies alive. And to the southwest, there was the possibility of exploiting a breakthrough into East Prussia itself. Of these options, Stavka knew that the breakthrough to the coast was probably well within the Red Army’s resources, but exploitation to the north or south was less likely to succeed. In both cases, significant rivers – the Venta in the north, and the Niemen, or Memel as the Germans preferred to call it, to the south – would act as major barriers to the advance. The priority, then, would be given to reaching the coast. Anything more would be a bonus. On the German side, most of XXVIII Corps’ fighting strength consisted of the arriving elements of Grossdeutschland and 551st Volksgrenadier Division. The remnants of 201st Security Division, which had been badly mauled during Bagration, held a segment of front to the north. The three grenadier regiments of Generalleutnant Siegfried Verhein’s newly formed 551st Volksgrenadier Division were, on paper at least, relatively strong, but most of the men had almost no experience of infantry combat, particularly in the brutal conditions of the Ostfront. Furthermore, the division was responsible for an unrealistic 48km of frontline. The initial Soviet artillery bombardment appears to have been relatively ineffective, however, partly due to foggy conditions that prevented observation of fire and grounded the Soviet Air Force. 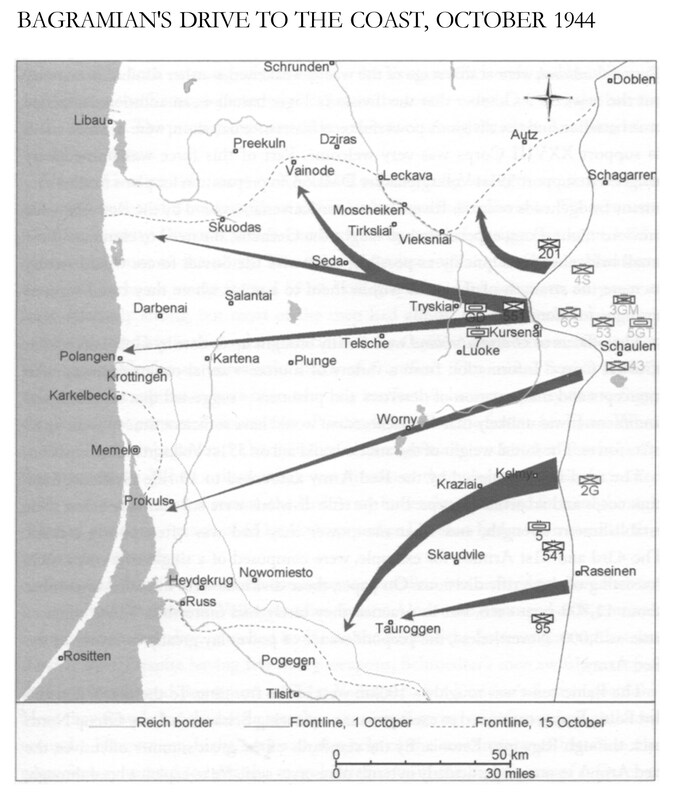 When the Soviet assault began on 5 October, the German grenadiers robustly threw back the first two attacks. When a third attack was thrown at them, however, their decimated ranks gave way. In several sectors, the Red Army forces simply moved forward through deserted positions – much of 551st Volksgrenadier Division had not survived its first proper day of combat. Grossdeutschland`s armoured reconnaissance battalion was ordered to move forward in support of the shattered Volksgrenadier division. Under the command of Rittmeister Schroedter, the battalion launched itself into the flank of the Soviet regiment that was moving west. 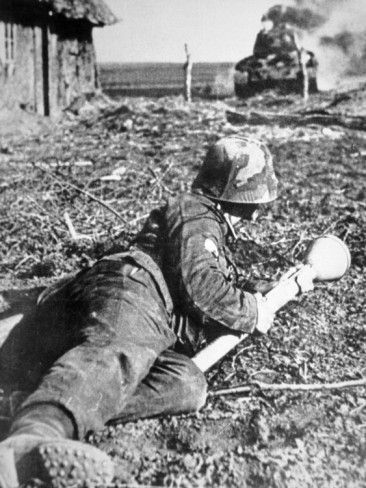 Despite having few heavy weapons, Schroedter’s men swiftly scattered their opponents and pressed on to 551st Volksgrenadier Division’s former positions. Here they found that the battle wasn’t over; a small group of infantry had coalesced around a Hauptmann Licht, and with the help of the reconnaissance battalion, the grenadiers continued to hold the main battleline until the early hours of 6 October. But with Soviet forces up to 15km to the rear of either flank, there was little point in holding on, and the amalgamated force withdrew towards the west. Now the black gun barrel and then the turret of a T-34 emerge from the branches. Head in, hatch closed, and a shout of’T-34!’… Richard Braumandl [the driver] shouts over the intercom, ‘Herr Feldwebel, T-34 to our front!’ Now there is turmoil… Feldwebel Isecke takes another two or three seconds, then presses the trigger. The shot leaves the barrel, bitter smoke fills the turret, and as soon as the barrel has returned from its recoil, I load the second armour-piercing round and switch on the turret smoke extractor. The breech snaps closed. But Richard Braumandl shouts angrily, ‘Herr Feldwebel, you have overshot, why are you firing high?’ What follows, I don’t hear. Isecke fires a second time. It wasn’t us, Isecke overshot twice, who was it then? We would probably have copped it, as we were only 120 metres away. It was Willi Hegen, the gunner in Oberleutnant Jakob’s vehicle. Everyone is trembling inside, as it is clear that our own gunner is a twit. He failed at the critical moment. We were almost done for. I knew why he had overshot. This great bullock didn’t determine the range in his Fitzerei [a term in the war synonymous with anxiety], and perhaps also used the high-explosive range marker instead of the armour-piercing range marker. That was the only way he could have missed. Soviet infantry were moving forward through the woods around the village. Lacking any infantry support themselves, the German tanks withdrew a few kilometres over a small river, the Shisma. Here they turned to face the advancing Soviet tanks again, and Huber’s tank commander, Feldwebel Sattler, attracted the ire of the company commander, Oberleutnant Jakob, when he decided to pull back from an exposed position. This precipitate retreat nearly ended in disaster, as the rest of the company almost opened fire on Sattler in the gathering darkness. A confused night action followed. Several T-34s were shot up at close range, but in the darkness other Soviet tanks had succeeded in infiltrating into the German position. At dawn, the Germans withdrew from their positions and the Soviet advance continued. On 6 October, Bagramian committed 5th Guards Tank Army to the battle, which was now raging across a frontage of nearly 200km. Schörner tried to extract units from the Riga front in order to send them south, but 2nd and 3rd Baltic Fronts, backed by the Leningrad Front, increased their own pressure on Riga. Several days of bloody attacks and counter-attacks around the Latvian capital resulted in little ground being gained or lost; Army Group North was effectively pinned in its defences, however, unable to move troops to counter Bagramian’s thrust towards Memel and the Baltic coast.